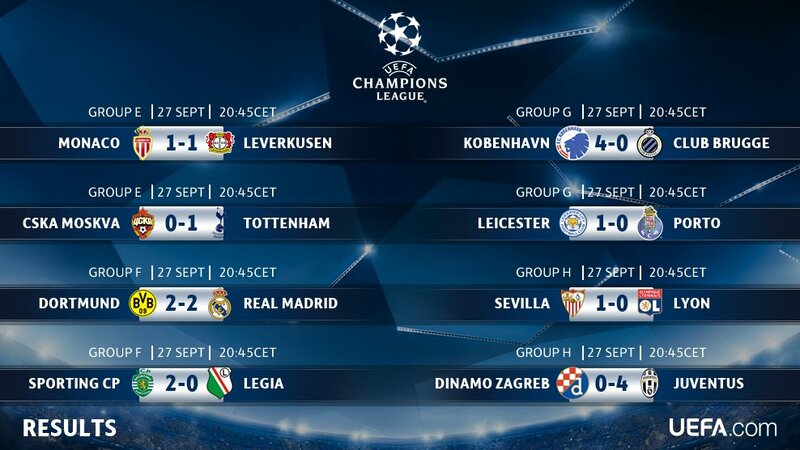 As far as goals were concerned, it was a rather quiet night around the continent in comparison to matchday one, although that didn't mean there was a shortage of good football. 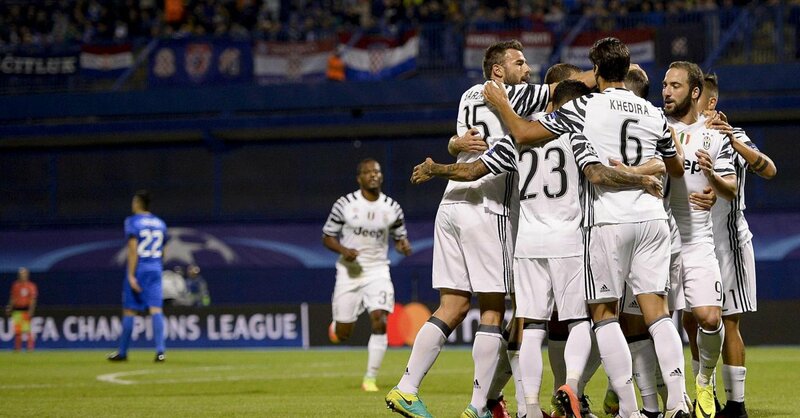 Juventus executed a clinic to dispatch Dinamo Zagreb, while Copenhagen replicated the scoreline against their Belgian opposition. Meanwhile, a spirited comeback in the blockbuster game of the evening's lineup and the continuation of Leicester's dream took more space in the headlines. An injection of late drama on the side too can't be forgotten - but who were the true stars of the night's action? Here's a look at the best of the action and the full results from the first night of matchday two. Substitute Andre Schurrle sniped a point for Borussia Dortmund from the clutches of defeat with a rifled half-volley after Raphael Varane had put Zinedine Zidane's side ahead. Cristiano Ronaldo had given the reigning champions before Pierre Emerick Aubameyang responded for the home side in the first half. Although an energetic start from the Germans would pin back their counterparts for the early stages, Real Madrid would make the breakthrough with Cristiano Ronaldo. They responded adequately to a missed chance at the other end, with James Rodríguez rolling it on towards Gareth Bale, who's backheel found its way to the star man to rifle a low effort to the far corner. Dortmund ensured they were not barged out of the contest, though, with an increase in pressing and sizable workload. And so it told, the timeliest of equalisers just before the break came in a bizarre sequence of events. Navas had an absolute nightmare, making a meal of a relatively straightforward save from a free-kick, punching it right back into the danger area under no pressure at all. A bounce off an unsuspecting Varane and back towards goal was enough to put the ball on a plate for Aubameyang on the line, as Tuchel's men deservedly drew level. Raphael Varane then made up for his unawareness in the first half by restoring the lead for Madrid in the 68th minute. Karim Benzema's volley had struck both post and crossbar before falling to Varane, goal at his mercy, and the champions were on their way to snapping a 3 game losing streak away to Dortmund. As fatigue began to creep into Dortmund's game, Madrid were able to counter at blistering pace, albeit to no great effect. The hosts still continued to create opportunites though, first with Christian Pulisic's solo run resulting in a goal-line clearance from Varane, before summer signing Andre Schurrle popped up to send a rocket of a half volley into the roof of the net to rescue the point for Dortmund. 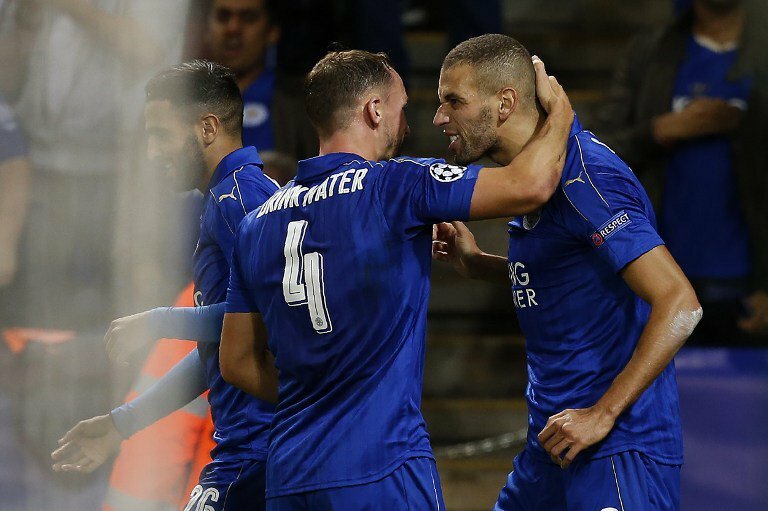 Surprise English champions Leicester City continued to defy the odds, continuing a perfect start as Islam Slimani's goal edged out Porto in the first ever Champions League fixture in the city. 1 - Leicester City are the first English club to win their first two games in the Champions League. Dilly. With Champions League football bracing the King Power Stadium for the first time ever, Leicester City threatened but it was far from one way traffic. Porto made it a scrap from the outset, right until the "Dragon Slayer" continued their fairytale. Islam Slimani nodded in from close range after a peach of a cross from his Algerian compatriot Riyad Mahrez, following a mouthwatering crossing of the flanks in the build-up. Nerves would fly up throughout the evening however, as Porto piled on the pressure. There was a scare just minutes after the goal when Miguel Layún's free-kick zipped into the side netting, before the closest call of the lot in the second half. The keeper came to get rid, but it fell towards Jesús Corona who looked to catch on to a volley, deflecting and coming off the post. Claudio Ranieri's smile would be preserved, as Leicester hung on, with Porto performing well but simply inadequate to take anything from the game. A magical night in Leicester's first taste of home European football, and one that takes their record to two wins from two games. Son Heung-min's lone goal helped Tottenham to the 3 points after a resilient effort from the English side at the Arena Khimk. Last season - 37 games, five goals. Dele Alli struck the crossbar in the most notable moment of a well-matched first half, getting the better of the keeper - albeit not the woodwork - as his long range effort swivelled menacingly. Still, the Russian number 1 didn't need to be too active, while his teammates put in a shift but nothing convincing, with the match perhaps lacking the tempo required at times. Eventually, Tottenham would get rewarded for their prevalent persistence, with Son Heung-min beating the keeper after marginally getting the onside nod from the referee. Lamela played him on to finish the job, with the keeper handling the strike, but lacking enough contact to stop it rolling over the line, and hence surrendering three points to the North Londoners. 2015 runners-up Juventus got off the mark with a comfortable thumping of Dinamo Zagreb in Croatia, with a Paulo Dybala rocket highlighting the bunch for Allegri's men. 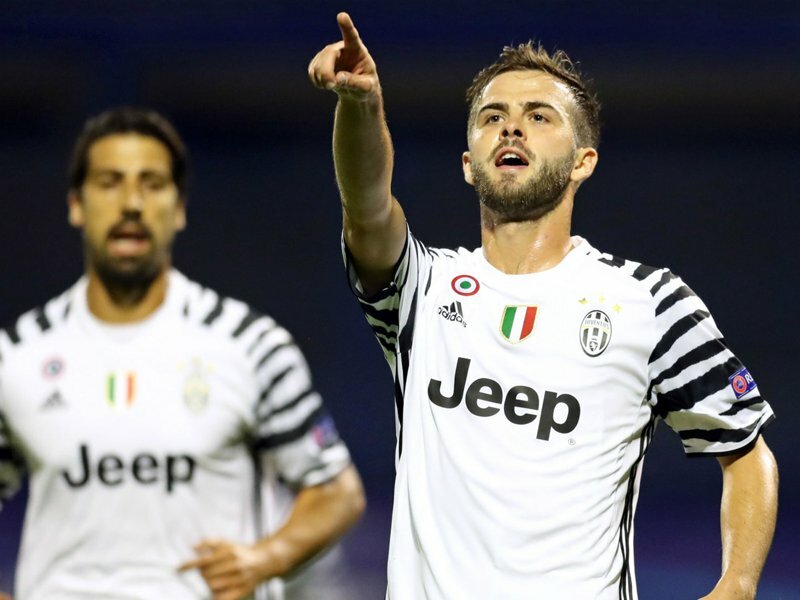 Juventus were steered in front through a messy goal finished off by Miralem Pjanić, concluding a goalless period in excess of 25 minutes. With the ball bouncing towards the defence, it was flicked back towards the keeper but with little time to chase it, the Italians were already closing in. It was straightforward for the Bosnian to slot in. Surviving a subsequent set-piece square, Pjanić then crafted an exquisite ball over the top, timed to perfection where the lethal Gonzalo Higuaín controlled it with one touch and then side-footed his side's way to a two-goal lead. 12 minutes after the half-time interval, Paulo Dybala made it three for The Old Lady with a blistering effort to wrap up the job against the Croats. Space opened up for him around 25 yards out, where he unleashed a net-busting strike as the Serie A leviathans continued to cruise. Things would end in cruel fashion for the hosts, as goalkeeper Adrian Šemper turned the ball into his own net after a troubling deflection. Dani Alves' free-kick bounced off the head of a defender, and while the goalie was able to tip it away, it ended up rolling over the net to wrap things up, as Juventus overcame a lethargic opening game to surge for their second fixture. Copenhagen constructed a second-half masterclass to extinguish Club Brugge, as Thomas Delaney's spectacular volley sealed the fate of the Belgians. After a stalemate first 45 minutes, an own goal from Denswil would open the floodgates as Club Brugge cheaply conceded. With little danger around him, he diverted the cross into his own net which would be the beginning of the end for his side. It could have been two not so long after, but a penalty was missed following a high foot in the area. Thomas Delaney doubled the lead in spectacular style with a jaw-dropping volley which whizzed into the top corner. The curve on the ball was marvellous, making the sweetest of connections from far out. 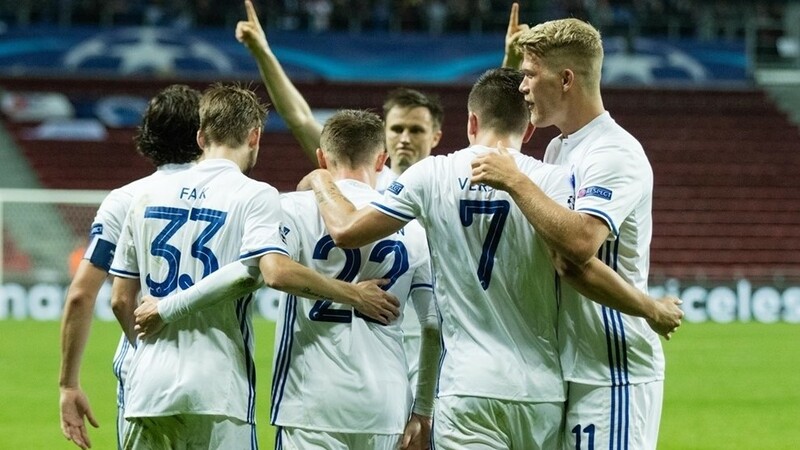 Santander then directed his effort high into goal to make it 3, and they were on cruise control straight to stoppage time before a fourth and final goal through a Mathias Jørgensen header. 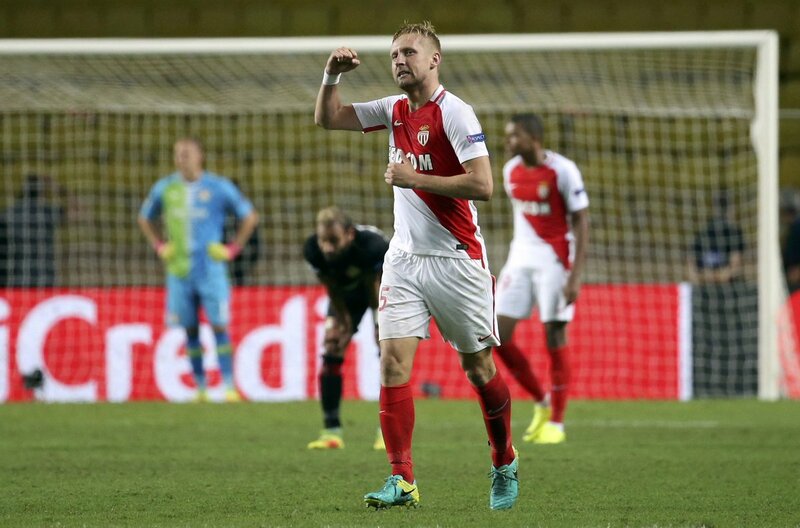 Monaco 1-1 Leverkusen: Kamil Glik secured a last-gasp point for Monaco in a dramatic conclusion which saw the Pole score on the 94th minute, after Javier Hernández bagged his 100th goal for a European club. Sporting Lisbon 2-0 Legia Warsaw: Lisbon handed new manager Jacek Magiera a defeat in his first game in charge as Bas Dost and Bryan Ruiz volleyed the side to a commanding first-half victory, preserved throughout the contest. Sevilla 1-0 Lyon: Sevilla clun on to their lead to halt the high-flying Lyon as a second-half goal from Ben Yedder made the difference. Vietto missed a penalty, although the Spaniards would not end up ruing that chance. A delightful assist and quality goal put the Bosnian atop the pile on a night where team performances shone through as oppose to individuals. It fell so kindly to him, and he unleashes a rifling effort leaving the keeper with no chance - that is the surefire goal of the night! Not as many teams were making the splash as expected, and with around 20 minutes before a goal came anywhere around the continent, it was quiet in most senses of the word. Still, there remained a catalogue of big moments, and with the halfway mark approaching, we are beginning to grasp who may just be able to pull this off. There is still, however, a long way to go. Juventus have announced themselves as contenders, while Dortmund and Real cancelling one another shows the field may be more level than expected.